Oodles of Art: One art show down, one to go. 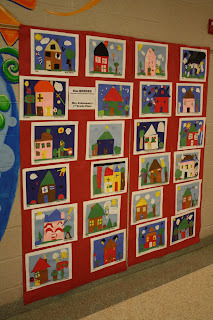 I had my art show at the primary building tonight. It went great! Many kids came with parents and it seemed like a success. I ended up hanging the artwork on kraft rolls of paper by class, and people around the school raved about the way it looked. I guess from the past, it has a much 'neater' and cleaner look...people were really happy with it, and so was I.
those displays DO look great! How big is your school? Hi Katie. I just found you via your other blog (where I loved your jewelry and the bird above your light switch!). I think the displays look sharp, too. Don't they always say at least half of it is presentation? It all looks so well organized - what a fun job you have! What great projects! 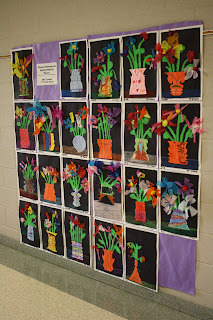 And they are displayed beautifully too! Congratulations on a great year! 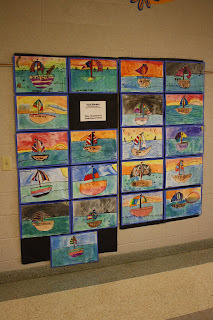 I really like the way you displayed your students artwork. It looked very neat and professional!